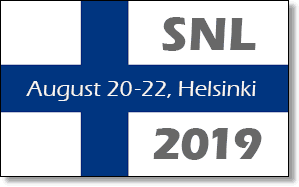 Proposals for the 2020 and 2021 meetings will be discussed by the SNL Board at the August meeting in Québec, so please submit applications or letters of interest before the upcoming meeting. We require a local organizing committee headed by a member of the Society who will work with the SNL Meeting Organizer to finalize meeting arrangements. SNL is interested in receiving applications for the United States, Europe, and other countries. Click here to submit an application. All proposals will be reviewed by the SNL Board who will contact applicants for further information, as needed. If you have questions, please Contact Us.